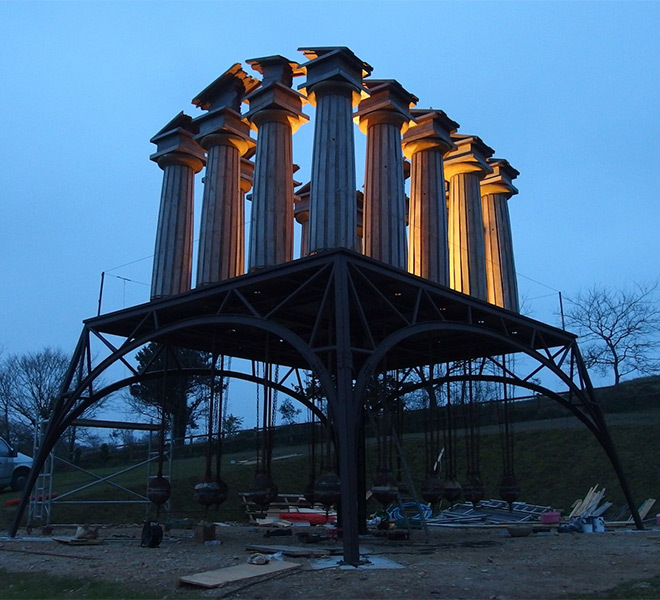 Restless Temple is an installation based in the beautiful Tremenheere Sculpture Gardens in West Cornwall. Designed to be in constant motion, the temple is made up of fourteen hollow cedar pillars, centered by tensioned steel and counter-weighted by concrete weights. It is said to represent flexibility in the face of the mighty forces of nature, and is permanently located outdoors amongst the brisk coastal elements. As such, Restless Temple required reliable structure lighting which would keep it illuminated through nightfall and in the face of all weather conditions. Restless was in development for almost fifteen years by artist Penny Saunders, during which time strong sculpture lighting became a priority. The structure needed to make as much of an impact – if not more – in the dark as it did in the light. However, with the temple located outside in the often wet and windy Cornish weather, the art installation lighting would have to be resilient. This challenge was given to bespoke lighting designer Eleanor Bell, who carefully selected Pulsar products to illuminate Restless Temple. Instead of treating Restless Temple as a building and using traditional uplighting on the exterior of the columns, Saunders asked Bell to focus on the inner space. The artist wanted to create a sense of depth within the interior through clever accent lighting. Given the temple’s position at the top of a hill in the Tremenheere gardens, it was also crucial that the sculpture lighting was able to withstand the elements. Bell designed a scheme that lit both the temple and the concrete weighting below using Pulsar’s 17 Watt, 3,000K outdoor LED spotlights with a 45 degree beam angle and mounting brackets. Within the cedar pillars she used four white spotlights to cast a warm light across the space, making the abstract structure appear to glow. Meanwhile, the section underneath is lit by a spotlight at each corner, each of dimmed to 50%. This lower artwork lighting allows visitors to see the mechanism in the dark without drawing attention away from the sculpture itself. The structure lighting comes on every day at dusk and stays on until 11pm, so the designer needed to find a solution with a long lifespan. Luckily, all Pulsar’s LED lighting fixtures components come with 100,000 hours of design life as standard. The sculpture was completed in 2015, and has been drawing in visitors from all over the world ever since. It wows day in and day out, with dependable art lighting fixtures which illuminate the temple and emphasise its interior depth as night falls. As leading LED lighting manufacturers in the UK, we are proud to have been selected to contribute to this sculpture lighting project. We are confident that Restless Temple will continue to impress for years to come. 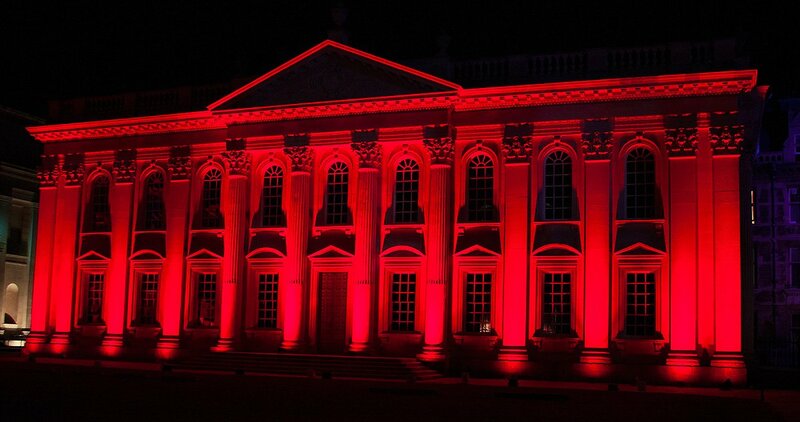 For further lighting inspiration, take a look at more of Pulsar’s LED lighting project transformations.